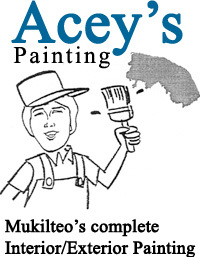 Acey's Painting - Mukilteo's complete interior and exterior, residential and commercial painting specialist! Third generation family professional - also serving Edmonds, Everett, Mill Creek & Lynnwood. Acey's Painting is a member of the Mukilteo Chamber of Commerce and the Better Business Bureau. Free quotes & color consultations available. Call (425) 349-3226 and ask for Wendy.